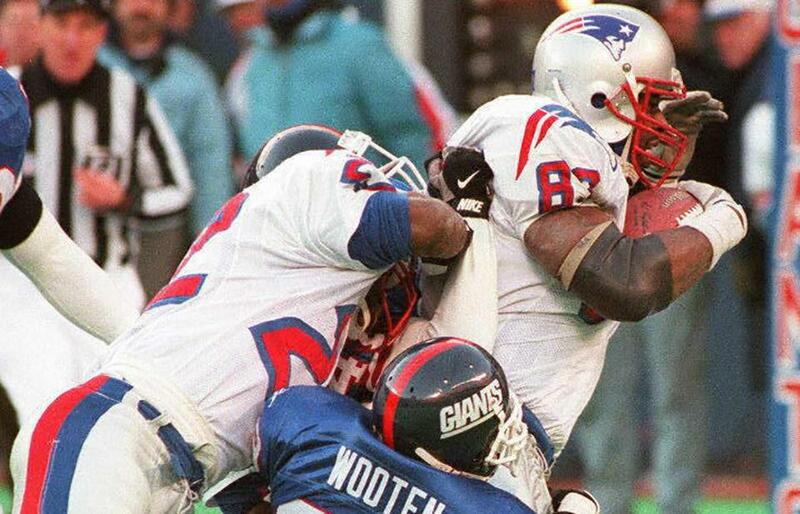 Ben Coates dragged Giants defender Tito Wooten into the end zone for the winning touchdown. EAST RUTHERFORD, N.J. -- The real Giants were David Meggett, 5 feet 7 inches, 195 pounds; Troy Brown, 5-9, 190, and Adam Vinatieri, 6 feet, 200 pounds. If not for those little players with giant hearts, the Patriots would not be sitting at home today, having ended their regular season yesterday with an 11-5 record, a first-round playoff bye and two weeks to prepare for a home playoff game at Foxboro Stadium. Those three, plus bigger bodies such as Drew Bledsoe, Ben Coates, Terry Glenn and a defense that shut out New York in the second half, made for a 23-22 regular-season finale victory over the Giants on the day Bill Parcells returned to the Meadowlands and opposing coach Dan Reeves probably said goodbye. Parcells was choked up with the emotion of the comeback from a 22-0 halftime deficit. The Patriots and Giants have played just 11 meaningful games in their histories. Look back on some of their matchups from the Globe’s archives. The turning point is open to debate. Was it Meggett’s 60-yard punt return to make it 22-17? Or Brown’s 13-yard reception, on his back, on a third and 13 to the New York 29 with time running out? The clincher was easy. That was a fourth and 7, 13-yard touchdown pass from Bledsoe to Ben Coates with 1:23 remaining that provided the winning margin. The Patriots had called time right before the play. Coates was not part of the formation that is normally used. In fact, Parcells said Brown was taken out of the game in favor of Coates. That was the culmination of a 75-yard drive that started with 7:08 left. Bledsoe, who had been an abysmal 12 for 20 for 64 yards and two interceptions in the first half, went 19 for 27 for 237 yards and two touchdown passes in the second half, to finish with 301 yards passing. Glenn, who caught eight passes for 124 yards and broke Earl Cooper’s rookie reception record, caught passes of 17 and 13 yards on the drive. Glenn had caught a 26-yard touchdown pass from Bledsoe early in the fourth quarter to pull the Patriots to within 22-10. On that drive, Glenn, who had left the game late in the third quarter with a left hip pointer, returned at full force. It seemed a desperation play, really. Third down, time starting to wind down, his team trailing, 22-17, Brown was on his back in the middle of the field, but reached back to grab the sailing pass and save the day. Vinatieri kicked a 40-yard field goal with 4:12 left in the third quarter to cap a drive that began on the New England 6 and featured Bledsoe-to-Glenn hookups of 31 and 29 yards. With 11:09 left in the fourth quarter, Meggett broke the play Parcells had been bugging him about all season, his first punt returned all the way as a Patriot. Mike Horan’s boot sailed to Meggett in the center of the field, and he ran right up the middle, needing to beat only Horan to reach paydirt. But then there was the 22-0 first-half deficit, similar to the 21-0 hole they fell into against the Jets here earlier this year. Bledsoe was awful. Curtis Martin, who essentially was taken out of the offense in the second half when the Patriots went to mainly passing formations, which include Meggett, gained only 20 yards on seven carries. Punter Tom Tupa was having an awful time for the first time this year. The Giants were blitzing, similiar to what the Cowboys had done a week earlier to disrupt Bledsoe’s timing. ``Not even the ‘27 Yankees could have won that game the way we were playing in the first half,’’ said Parcells. There were awkward plays and calls. Armed with Meggett, his All Pro returner, Parcells elected not to take the ball at the 22 after Meggett had fair-caught a punt in the first quarter. The Giants were called for an illegal man downfield and Parcells made the Giants re-kick. In hindsight, a bad decision. The short punt hit the turf and took a New York bounce to the 4. After two failed running attempts by Martin, Bledsoe was rushed hard from the left end by Mike Strahan and forced to throw the ball into the turf (intentional grounding in the end zone), which was ruled a safety. Tupa’s poor punting, missed tackles by Lawyer Milloy and Willie Clay, and Brown burning Otis Smith twice before Smith turned his game around with some aggressive play in the second half, all produced a 15-0 New York lead. Bledsoe’s woes reached their height when he threw the first of his two late second-quarter interceptions. Throwing for Glenn just off the line of scrimmage, Bledsoe’s pass was picked off by cornerback Jason Sehorn, who ran 23 yards to the end zone, making it 22-0. Bledsoe threw another interception with 2:40 left in the half at the Giant 8. “Man, we have to stop playing games in this place. We only play good for half a game,’’ said McGinest.